Emily is a Master’s student in the Department of Geography at the University of Alabama. Her broad research interests are in environmental change, community interactions, and in how animal populations vary across space and time. Her previous work has focused primarily on aquatic ecosystems in northern latitudes, but she has recently been investigating questions that pertain to the upper Bladen River near BFREE. In 2015, she earned her B.S. in ecology from Winona State University in Winona, Minnesota, where she also worked as a veterinary assistant. In her free time, she enjoys raising assistance dogs for people with disabilities. 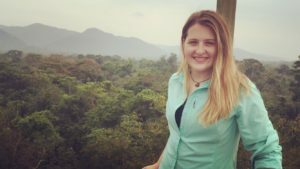 After completing her M.S., she plans to continue her education by pursuing a PhD in conservation biology. This project aims to reveal vulnerabilities of cichlid species in a river that is under threat by global climate change and invasion of African tilapia. The Bladen River is home to several cichlid species, which provide parental care by defending their broods from predators. Exactly what makes a good place to nest, however, remains unknown. I seek to uncover the factors that compose ideal locations using a spatial modeling technique called maximum entropy. Ideally, my models will have practical applications for the rest of the Bladen as well as similar neotropical river systems.